Long before it was adapted into martial arts, the study of internal energy (known in Eastern cultures as prana, ki or qi), was developed into a mind-body discipline of health, longevity and personal power in select Indian and Chinese yogic arts. A brilliant scientist who had once conducted classified research on the subject suggested the model of qi as “information.” The investigator explained that Qi, most likely acts as a kind of information-intelligence system operating within the body’s subtle electro-magnetic system of the body. According to the model, this system, working within the confines of the subtlest of detectable electro-magnetics, is busily conveying data, the function of which is to organize nervous system, thoughts, and emotions throughout the holistic-unity seeking human body. In this light, the qi energy matrix thought of as a conveyor of intelligence between the body’s life support, emotional and survival systems that work alongside of, yet independent from, the central nervous system. The researcher used this model to explain a type of “internal energy punch” he had witnessed. In this example, the strike was delivered to its recipient from a few inches away, with no obvious mechanics or weight behind it. It appeared to be no more than a light tap, yet had a significant effect on the experimental subject. Interestingly, the demonstration also produced physical evidence in the appearance of an approximately three inch spot on the opposite side of the recipient’s body. The scientist suggested that this type of punch and its demonstrable effect was most likely not due to direct electro-magnetic or other energy, but was brought about by a subtle information set encoded in the strike. According to the model, “information” exchanged between the performer and recipient of the “internal punch” caused a type of system breakdown that resulted in the more appreciable effect than could be accounted for by the apparently light tap. Could this be the explanation for internal energy in the martial arts? 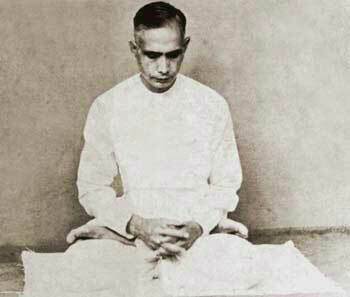 Sri Surath. By chance, coincidence or blessing? John had increased awareness of bio-energy fields shortly after working with Surathji. My first experience with what I came to understand as internal energy took place way back in 1979. This was an experience that completely changed how I would practice the martial and healing “energetic” arts. My ability to sense and work with internal energy directly in an experiential and tactile way began shortly after I treated Sri Surath, a Bahki yoga master from India. Surathji was suffering from a serious illness, but refused to take any modern Western medication. I was granted the rare privilege of being allowed to treat the Brahman with traditional Chinese bodywork. 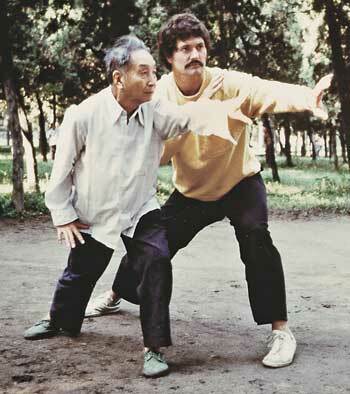 Master Liu Xing-Han shows the author the finer points of Ba Gua in 1988. A short time after I began my work with Sri Surath I started to experience increased and (to me at that time) strange energetic sensations. I began to sense subtle bio-energetic life fields both internally and externally to my body. I found that as I became more sensitive to these fields, I was able to achieve greater success in both martial and healing practice. It was very empowering to experience the reality of a subtle bio-energetic field and to find that it was possible for me to sense and control it. Increasingly, I became a believer in the value of personal experience of internal energy: one that placed importance not only on physical mechanics, but that also included developing awareness of, and training for, the internal energy field. I’ve been using the model of a student or patient learning to personally experience internal energy as a model ever since. Students often ask how they can develop their own sensitivity to internal energy. I tell them that the two most important things are open-mindedness and trust. By trusting that the subtle energy field exists as physical reality, the mind opens to the possibility of increased awareness of the qi energy matrix. On the other hand, when one is overly skeptical of the energetic field’s existence as a physical reality, the mind’s filter works overtime to preserve the status quo of the individual’s belief system; the unconscious chooses an explanation of the world and phenomenon which is non-threatening. However, it is important to mention that being open minded does not mean abandonment of critical thinking, only becoming aware of the power that one’s attitude plays in the perception of the external world (i.e., that the perception of reality is personal and subjective). In my own practice, I work on remembering the power of the unconscious mind to oppose new changes to how and what one perceives. The act of being open to the existence of the subtle energy matrix as a possibility encourages electrochemical changes in the brain. This in turn encourages sensitivity to, and development of one’s own internal energy field. Most open minded people, given the right conditions, are able to develop the ability to sense internal energy through and around their body to at least to some degree. This ability seems to be independent of age, education or life experience. Some people have been not only able to sense, but even (given the right conditions) see their own or another’s energy field extending a foot or more outward from their own physical form. The ability to sense and develop internal energy is related to personal and social evolution. It is personal since each individual has the potential to sense and develop internal energy and positively influence his or her personal growth and understanding through the process. It pertains to social evolution through its universality and positive potential consequences to society. If it really is the basis of human energy, health, and a higher order mind-body integration, this suggests attributes that speak to the underlying codes of the human spirit and potential that go beyond differences in culture or religion. However, as I can attest, the ability to perceive the bio-energetic field does not mean that one has attained some kind of personal perfection. The activation of latent skills, because of the degree of introspection and sensitivity required, usually indicates evolution in progress, or at least the aspiration toward advancement. This evolution is characterized as the ongoing, transformation and exchange of coarseness for subtlety. In practical terms it requires giving up callousness and tension in form and mind and replacing them with sensitivity. In human terms, it makes one gentler. In internal martial and healing arts it manifests as less need to resort to obvious strength or technique alone, relying instead on lightness of touch. In healing terms, sensitivity like this opens the doorway to being able to medically intuit the cause and cure of pain or disease and assist the patient’s energy in the healing process. More information about this subject may be found in Ba Gua: Hidden Knowledge in the Taoist Internal Martial Art , by John Bracy and Master Liu Xing-Han. North Atlantic Books, 1998. ^ This entry was taken from “Finding Qi in Internal Martial Arts” which originally appeared in Qi Journal, Summer 2002. It was modified to fit the stylistic requirements of Qi Encyclopedia. ^ Most likely sent through a measurable, but barely detectable bio-electrical signal. This might be compared to a telephone which transmits data through a nearly faint electrical signal that is interpreted a certain way on the receiving end. ^ A good example is our blind spot, and the way our brain fills in the visual gap created by the blind spot the place where the optic nerve ­attaches to the retina, thus creating a hole in the visual field. The visual impression of what is filled in by the gap is a fictional coloring of logical background that may, or may not exist. We all have these visual holes that we are not aware of. This illustrates the power of the mind to create the world that it believes exists.